Vermont V.O. 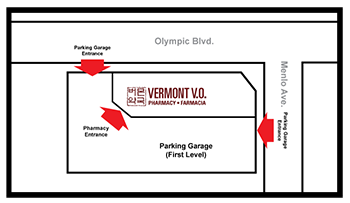 Pharmacy is an independent and family owned and operated pharmacy offering Immunizations, Medi-Cal, Medicare Part D & ADAP. We are very quick, efficient and friendly. We speak English, Korean and Spanish. We understand you have many choices to fulfill your prescription, among they many big bog pharmacies. Many of these have lost the personal touch and caring that should come with service to our community. We also provide patient education. If we don’t have a product, we can probably find it. As your neighborhood pharmacy, we strive to be your healthcare problem solvers. We want to be the solution to all your healthcare needs. Vermont V.O. Pharmacy is built on one philosophy; that our patients’ health and well-being is our primary focus. We treat all our patients as part of our family. We are committed to delivering the best quality solutions for our patients’ health at the best possible cost. We ensure the best solutions through our compound pharmacy, granting us the ability to make new medications suited for your needs. If you need a doctor, call us and we would be happy to recommend great doctors around the area. We offer delivery to patients with special needs. If there is anything that you would like for us to carry, please, let us know. We would be happy to help you.